Maruguke obijime (丸ぐけ), or „maruguke“, are the only non-braided obijime. They consist of stuffed fabric tubes, usually made from silk or polyester. Other textiles are possible but less frequent. „Maruguke“ (丸ぐけ) means blind stitched in a tubular shape („maru“ = round, „guke“ or „kuke“ = blind stitch). Maruguke have a diameter of ca. 1 cm and a circular cross-section. The knot tied with a maruguke is quite big. Those special obi cords don’t have as much tensil strength as marugumi or hiragumi. If squeezed a little bit they feel rather soft. 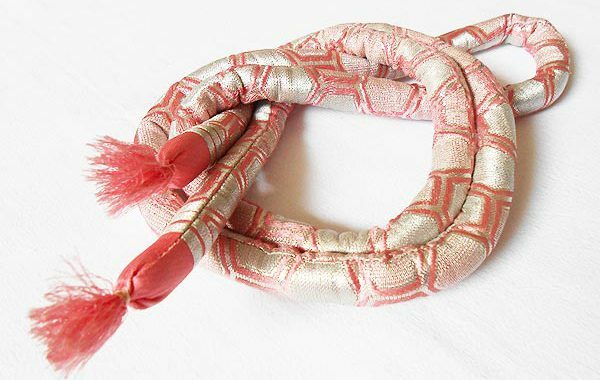 Being comparatively voluminous, maruguke usually are stiffer than (especially when made of brocade), but not as robust as braided cords. 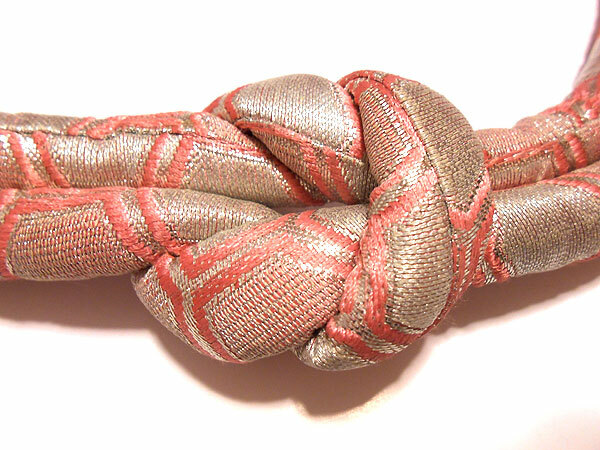 Also, they don’t enable so many tying variations like the other types of obijime. The ends of the maruguke can be fringed. But I’ve seen many of them without any visible fringes, especially on very simple maruguke. So, both variations are possible. More often than not, the fringes are far thinner or shorter than on the other obijime types. The fringes on maruguke are made of the warps of the tube fabric, or are applied after stitching the ends of the cord up. 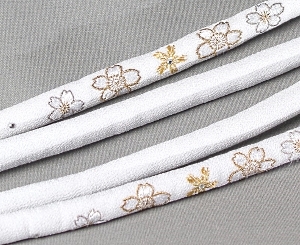 These days, maruguke cords are used mostly on the bride’s outfit. In that case they are white or red. But because of the traditional colour habits getting more and more relaxed, we increasingly see brides wearing other maruguke colours like purple or gold. Young women tend to wear maruguke in vibrant colours when putting on their formal furisode attire. Many decades earlier, the maruguke were put on with fudangi (every day wear), too. The maruguke since then have gradually been superseded by hiragumi and marugumi so they are worn less frequently these days. Nevertheless they can still be worn on everiday kimono without problem. In that case, just choose a maruguke in colours and style which are appropriate for the respective age and social status (subdued colours and style for married women, lively colours and style for unmarried women). However, the colour black is preserved exclusively for the attendants of a funeral! And this one is about the marugumi obijime. Don’t miss it! Which diameter does a maruguke have? Maruguke obijime usually have a diameter of 1 cm. There are other diameters like 0.5 or 0.8 cm. Or even more than 1 cm. Meanwhile the thinner types are not as sturdy as the thicker ones. A bigger diameter at the same time means a thicker knot, which not everybody might be fond of. Those who don’t like the voluminous knot could try a thinner maruguke or a different type of obijime. It is a well-known fact that japanese women are very slim. One of the side-effects of that slim physique unfortunately is the obijime being far too short for the waist of us western women. A standard length of 140 – 150 cm will be too short for many of us. Maruguke are used for little girls‘ formal outfits, too, but they are obviously much shorter than those for adults. waist circumference in cm x 1,9. Thus, for a waist of 90 cm the result is ca. 170 cm. With this rule of thumb you know which length you need to tie the obijime appropriately. The ends of the cord should end at the right and left sides of your obi, so your elbows can touch them. The stuffing can consist of wadding, respectively wool or cotton thread. More often than not, maruguke are stuffed with bundles of wool or cotton threads, which are inserted in the prepared fabric tube. Wool stuffing results in a softer obijime than with cotton stuffing. How to make a maruguke? Don’t worry, even beginners can do this! Cut a strip lozenge strip of fabric of some 3 cm width and, for example, 161 cm length (waist ca. 84 cm, seam allowance included). Sew the long edges with a seam allowance of ca. 5 mm from one end to the other. Now you have a tube. Turn the tube inside out and pull a bundle of wool or cotton thread through this tube. If it is not enough of stuffing, just pull it out and add some threads. Repeat until the maruguke has the right touch-and-feel for you. How thick the bundle of threads should be and how many strands it should contain depends on the type of thread you are using. With a thicker thread you need less strands for a stuffing bundle than with thinner thread. After finishing the stuffing task, sew the ends closed (or tie the closed). Here, you can decide which kind of refinement you prefer: fringes or tassels. Or keep it like that with undecorated ends. I must admit the stuffing with wadding is a very tricky task, which I gave up after discovering the thread stuffing method. Apart from maruguke obijime I am selling marugumi and hiragumi obijime. Let’s what obijime are in stock! Posted in Beim Tragen sichtbare Kimono-Bestandteile, Kimono-Accessoires, Kimono-Zubehör, Obijime, Start für Kimono-Anfänger and tagged Maruguke, obi cord, obi tie, obijime, stuffed obijime, tubular obijime, おびじめ, まるぐけ, 丸ぐけ, 丸ぐけ帯締め, 帯締め.